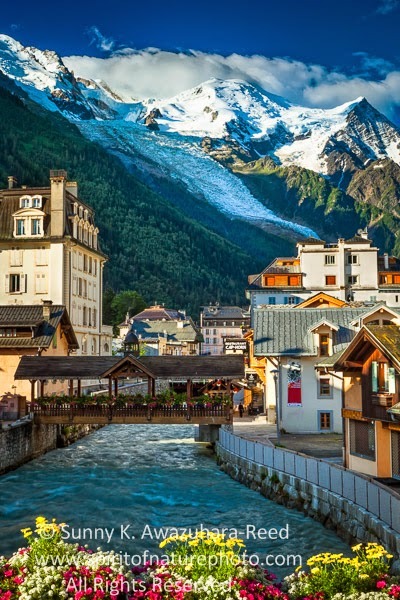 Meaning “White Mountain,” the massive Mont Blanc lies on the border of France, Italy and Switzerland. 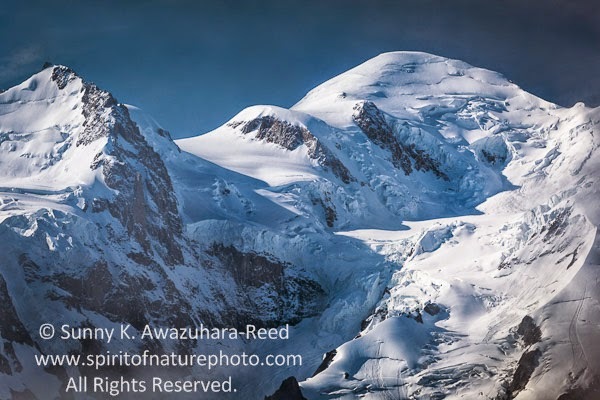 When the summit of Mont Blanc and its glaciers appear under blue sky, it is breathtaking. 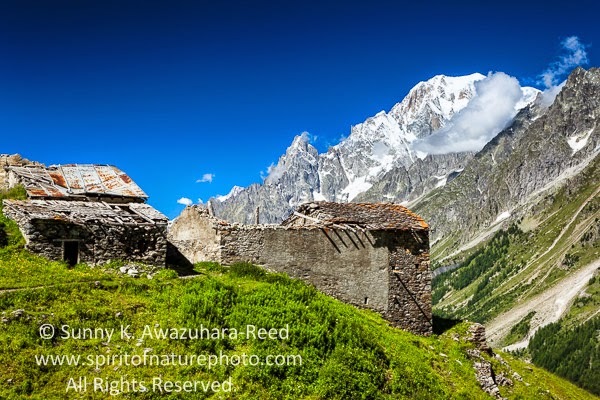 I was exploring the European Alps in July to photograph this massive Mont Blanc and surrounding landscapes. 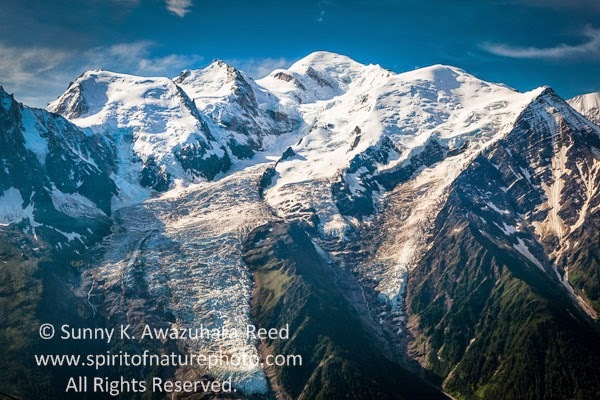 I hiked the entire “Tour du Mont Blanc” trail, 110+ miles (160+ km) circling the mountain with camera gear for 2 weeks. I saw and photographed Mont Blanc from different angles throughout the walk. The French side, above the town of Chamonix is the most impressive. When it’s clear, the white peaks tower above the town. 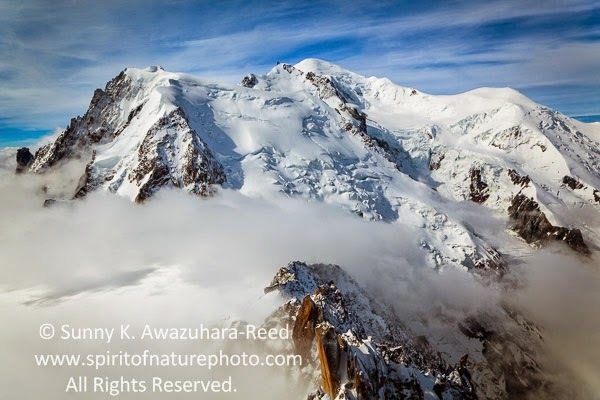 Since Mont Blanc is massive, the mountain creates its own weather, which is often covered with clouds, just like Alaska’s Mt. McKinley. Viewing the entire Mont Blanc requires good luck. What is most convenient for a photographer in this area is that there are some transportation options to take us to amazing vantage spots in just a few minutes using cable cars. 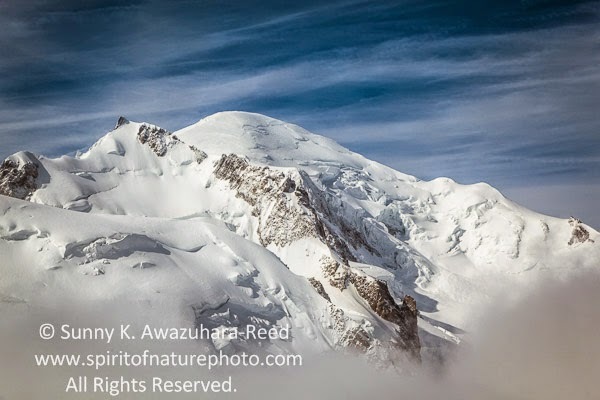 These close up images are from the top of Aiguille du Midi (12,605 ft/ 3,842 m). It was foggy and white out when I reached the viewing deck on the summit in the morning. The thick fog slowly drifted away, and Mont Blanc is seen slightly through the fog. It was a teasing. 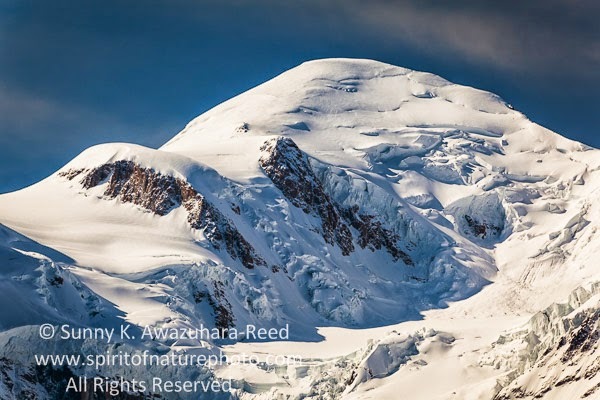 The strong breeze blew away its white veil and the entire mountain showed off against blue sky! The mountain was huge, shining white under the morning sunshine! It was very close to where I was! I kept shooting the mountain while the fog came and went… Then the mountain decided to stay out for a long period. This is the Italy side of Mont Blanc (“Monte Bianco” in Italian). After some rainy days, the mountain showed off again just before sunset. The mountain was still out next morning. 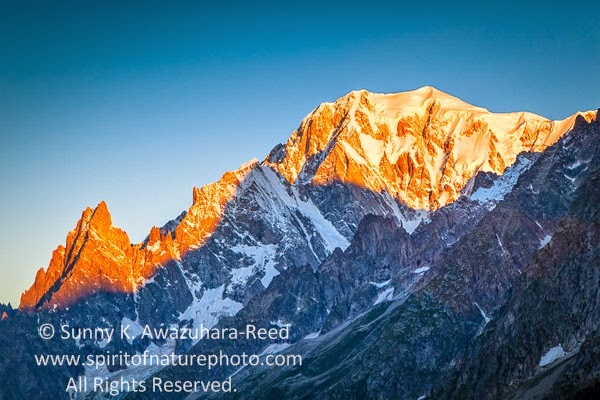 The summit was glowing in golden orange with the rising sun. Some more images from the French side. From Le Brévent summit (8,284ft/ 2,525m), across Chamonix Valley, the perfect view of Mont Blanc when it’s clear. After several rainy days, finally the weather was nice on my last day in the area. I will continue posting more photos from European Alps on next update.